The days in which we create roofing from local slate and rely on nailing them in place are far behind us – these days we aren’t limited by what materials are produced close to home, nor by what tradition dictates. Thatched roofs and slate roofs might have stood the test of time, but modern architecture is looking for ever more exciting alternatives. One of the options we offer here at MJO roofing is a green roof – and this comes in many forms, which we can talk through with you if you’re looking to head down this route; just call us today on 020 8953 2306 to discuss your goals. We take pride in the high quality of work and materials we provide for all of our clients, and are always looking for the best way to maintain modern practice and open up what we can deliver to a wider scale. Looking for eco-friendly products which suit any budget, led us to look beyond traditional roofing materials. Why is historic building conservation so important? More than 215,000 new houses were built last year in the UK, to house an ever-expanding population. But what happens to old listed buildings? If they’re not looked after with the right care and attention, they deteriorate - and can quickly become beyond repair, meaning the UK loses yet another piece of its heritage. Read more: Why is historic building conservation so important? The team at MJO have had a wonderful summer of gardening in Wembley… But not just any gardening – we’re talking about the Green Roofing variety. 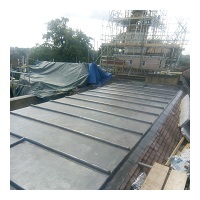 The team at MJO Roofing have been busy this summer, replacing the lead roofing on the 16th Century Bruce Castle, in Tottenham. With temperatures reaching over 30c, our team had an interesting challenge on their hands! MJO Roofing Ltd is made up of forward-thinking staff that deliver the best in class roofing at the point of delivery. With a vast wealth of knowledge spanning over 25 years, MJO Roofing Ltd offers a wide range of inclusive services and solutions. 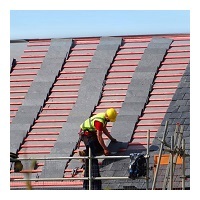 Every year, MJO Roofing Ltd complete over 5,000 projects of any scale or nature, covering a variety of sectors. Read more: We are expanding! 17th century Bush Hall is a Grade II Listed Building located between Welwyn Garden City and Hatfield in the hamlet of Mill Green. The building is said to have belonged to a Sir Robert Chester, who lived in the house in the early part of the 19th century. However, the building was only officially listed on 9th December 1983. Can’t take the heat? Roofs, roads and train tracks are melting across the UK! Have you heard of Blue Roofing?